$6.99Pink Heart Glow Wand - 8"
Actually, it’s not really magic. It’s science! Glow sticks work by creating a simple chemical reaction called, chemiluminescence. It’s really quite awesome! Inside hydrogen peroxide and tert-butyl alcohol mix to create a pleasant glow. Depending on what kind of dye is inside, you get the various bright colors that you see. So, now you know, it’s not magic, its… aw what the heck! It’s basically magic. 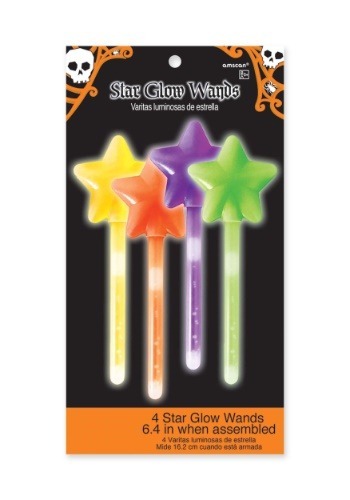 Now, you can harness the power of science to create a magical effect by using these star wand style glow sticks. This particular pack of glow sticks comes with 4 separate glow wands in 4 different colors: yellow, red, purple, and green. They measure at just over 6 inches long and to use them, you simply bend the wand portion to create the chemical reaction! You can hand them out to your friends, or keep them all to yourself. Whether you decide to use these glow sticks for an education moment with your newfound knowledge about glow sticks, or you just want a sweet accessory to add to your wizard costume, these glow sticks are a great addition to any costume. No matter what you decide to use these for, they’re sure to create a magical effect!